A good example of this is Jason Gimba’s Precinct 17, which is set in pre-Uprising City 17, Half-Life 2 but is detailed more similarly to an Episode 2 map, with more brushwork, props, higher lightmap density, particle effects and HDR. Undoubtedly, it is also structured better than old Half-Life 2 levels and mods, with clear distinction between action and calm moments, and there are plenty of techniques which manage how the player is led through the level and how they discover their surroundings. Custom models, textures, music and other assets are very welcome, as long as they are integrated well into the environment. This challenge is a joint challenge between RTSL and Niker107. He suggested the theme, wrote the description, the length of time and other aspects. Essentially, it’s his challenge but run through RTSL. In addition, I am also very pleased to announce that a Metrocop facemask will be very kindly supplied by Michelle Sleeper and you can actually watch them being made on the Making It Up Twitch channel. Go check it out. Shows are on Tuesday and Saturday. For this challenge you MUST NOT USE the RTSL MDK. This challenge is for Episode Two. However, we would still like you to use the RTSL Submission Template. As detailed in the General Rules, Lost Coast assets can be used. Please pack them into your BSP. Niker107 – NostalgiaVille host, HL2 mapper, RTSL ville participant, Joint 2nd Place winner of The Hammer Cup 2016. TanookiSuit – Experienced CS:GO mapper, member and staff on MapCore.org, 3rd Place winner of the MapCore 2017 level design competition. 3kliksphilip – CS:GO / Source mapper, creator of many early Hammer tutorials, prominent CS:GO YouTuber. Klems – HL2 and CS:GO mapper, 1st Place winner of The Hammer Cup 2017. The scoring system will also be announced soon. DO NOT GET OVERLY AMBITIOUS. If you can’t build it in about 6 weeks then think smaller. Something is bound to delay your progress. Leave time for testing, bug fixing and polishing! We highly recommend getting your map beta tested by somebody you trust. Do this early in its development if you can. If you are a Discord user and want to chat about the event then please feel free to join the official RTSL Mapping Challenges channel over on the Source Modding Community Discord server and get chatting. Other people may only help with the creation of custom assets and not add to or edit the maps. Maximum three maps per mapper per entry. By entering the competition you grant PlanetPhillip.Com and RunThinkShootLive.Com the right to release the map as part of the RTSL-SC2018-NostalgiaVille Mod. Other assets are allowed with written permission from their original authors, which MUST be included in the entry, preferably a link to a public page that shows permission has been granted. In addition, custom assets MUST BE ABLE TO BE USED IN MONETISED VIDEOS. Phillip and Niker’s decision is final and no correspondence will be entered into about it. If you do not receive a confirmation email within 24 hours of sending an entry, contact Phillip IMMEDIATELY. REMEMBER, any custom content must be able to be used in monetised playthrough videos posted on the internet. Enter well BEFORE the deadline. I will accept all late entries as bonus maps. Last year, I was flexible regarding entry deadlines, but NOT THIS YEAR. Even 1 minute is late! It is also WHEN when I receive it NOT when you send it. Please follow the submission guidelines, included in the submission template carefully. This submission template must be used UNLESS you are sending in just a BSP file. Upload your compressed file (rar, zip or 7zip), using the Submission Template to a free file sharing service. Please avoid Google Docs – it’s often difficult for me to download from them. We can’t wait to see what entrants create, just remember when players play the map it should feel like a better version of Half-Life 2. As always we look forward to playing the results! If you have ANY questions, please don’t hesitate to ask, either here in the comments or by email if you prefer a private answer. great idea for a challenge! was replaying the original levels they have something solid an integrity to them a lack of hyperbole that crept into the episodes a little and broke the immersion. Yep. But by “modern standards” we’re really talking about level design and detailing rather than gameplay of modern shooters. RTSL is teaming up with http://www.msleeper.com to provide a fully-finished metrocop helmet as a prize for NostalgiaVille. Can’t thank Michelle enough for the support and be sure to check out the twitch.tv/makingitup stream to watch them being made. Should we assume from this rule that the challenge is essentially meant as a one person design effort? A map designed by two can’t be submitted as such? We’d love to work on an entry but we’d ideally co-design the thing, on top of asset work being distributed between us. …also, our interpretation of this rule is that it limits anyone else working on the map to focus solely on asset work. Being that the latter takes up a fairly significant chunk of time, and that it’s pretty interweaved with the design in terms of having to jump between them to make sure they align properly, it starts to feel less worth it for anyone but the submission holder to become involved. The reason the rule against having more than one person work actively on the map or on the assets is to keep the competition fair. If there was an entry that was made by two people, it could undoubtedly be a lot better than those created by single entrants, but it would be unfair to judge it against others on equal terms. Under the rules of this competition, the entry should mostly be done by a single person. Custom assets here and there are fine to spice things up, and since mappers don’t usually know how to model, it is allowed to have an asset “helper”. However, if you’d be fine with participating in this challenge outside of the competition aspect (so, submitting your map as a bonus map), I would personally love to see what you could create as two mappers and modelers (as far as I can tell), and I’d value that kind of contribution just as much as an entry made by a single person. I know the rules mention the map should be from City 17 to Coast but would a Citadel-themed map be allowed? The Citadel levels were by far my favourite. The architecture was just so vast and alien, it was awesome. Plus it had some great puzzles and ambience. Personally I would jump to play any new Citadel map if I was given one, but the judging process and the overall consistency between the entries would be hurt if I were to broaden the boundaries of the theme further. As it stands, for NostalgiaVille, the Citadel is excluded from being accepted as an official (non-bonus) entry. But don’t let that stop you from including Combine architecture in the HL2 environments included in the theme! Perhaps this could be an interesting way to see how City 17 or the canals would look like if they had more Combine technology in place. I particularly like the APC garage in one of the airboat maps where the player has to open a big water gate. Hi, I want to build train station from this concept , and put all scripted events from standard hl2 maps, so it will be the same story, but with different layout and visual style, will that fit into this challenge? If the map consisted solely of a visually redecorated train station and with all the regular citizens, metrocops, and other entities in there… then I would probably say no. Remember that, while this challenge limits what environments you can use, every mapping challenge is about producing interesting gameplay (and RTSL challenge entries must always include at least some action / puzzle elements). 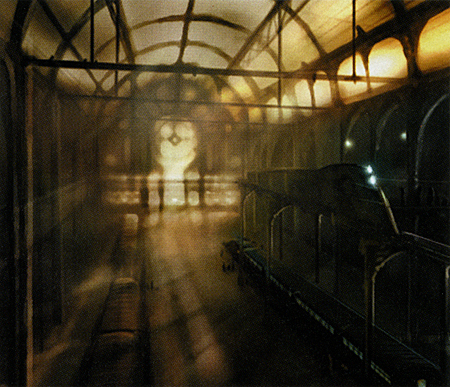 My suggestion for your idea would be to go with the concept art visual style, but still make it remind the player of the original train station, and include at least some form of gameplay …if that all makes any sense. Thanks for the reply. Yes I have plans to expand the area with some environmental puzzles. Ideally, I’d like to rebuild first two chapters, up to the Kleiner’s lab, not sure how much work it’s gonna take, that should fit into 3 maps I guess… I will only submit it, if there will be enough gameplay and satisfying visual quality. Geez, I’m late! I have some little free time to join up in this one – I’ve also watched good old Half-Life 2 E3 2003 trailer. I know one specific environment to make references! I hope I can make it in time! Oh wow, this is really cool! I came onto this really late into the development, but I’m interested in participating. I had an idea, but I think I have a question first… are we allowed to use one of the existing Half-life 2 maps as a base for this contest and build out from it? Going from the description, it sounds like this is encouraged, if anything. Also, are there any available beta testers to play through maps like the beta test network or anything? I don’t really have a lot of friends that play Source. Thanks, and I look forward to trying out for this one! I’m glad to hear that you’d still like to participate; remember, there is still more time left than the usual challenges. However, you are not allowed to use an existing Half-Life 2 map as a base and modify it for this challenge. You are meant to use one of the early HL2 environments, by that we mean the general palette of textures and models used in that area, the type of things that happen there, etc. and create your own level around that area. As said in the description, you can add short segments of the original maps to tie your level into original storyline, but they shouldn’t be the main gameplay areas of your map. You are also encouraged to try out new things in the environment you choose. I might keep a log going for it as I make time, but it’s not looking too hot, at the moment. This is a question in general, not specific to just NostalgiaVille. Are people allowed to use mapping editors other than Hammer for entries? Yes, it’s never been in the rules and is thus allowed. One map I know was generated by a script was krassell’s Micro Adventure in the Billion Units Experiment challenge. So as far as I can tell you can’t reuse ANY segments from ANY HL2 map already created, right? I’m wondering if I can do something like returning to Eli’s lab when it’s half destroyed, or going back to the first part of Ravenholm to tie everything together. The judges for NostalgiaVille have finally been announced. More details in the Judges section of the post above. When is BONUS MAP deadline? About 2 weeks after the official deadline. This looks promising… can’t wait to try it out.